and brewer, born in Salford, Lancashire. Joule studied the nature of heat, and discovered its relationship to mechanical work (see energy). This led to the Law of conservation of energy, and this led to the development of the First law of thermodynamics. The SI derived unit of energy, the joule, is named for James Joule. He worked with Lord Kelvin to develop the absolute scale of temperature. Joule also made observations of magnetostriction, and he found the relationship between the current through a resistor and the heat dissipated, which is now called Joule's first law. The son of a wealthy brewer, Joule was tutored as a young man by the famous scientist John Dalton and was strongly influenced by chemist William Henry and Manchester engineers Peter Ewart and Eaton Hodgkinson. He was fascinated by electricity, and he and his brother experimented by giving electric shocks to each other and to the family's servants. As an adult, Joule managed the brewery. Science was merely a serious hobby. Sometime around 1840, he started to investigate the feasibility of replacing the brewery's steam engines with the newly-invented electric motor. His first scientific papers on the subject were contributed to William Sturgeon's Annals of Electricity. Motivated in part by a business man's desire to quantify the economics of the choice, and in part by his scientific inquisitiveness, he set out to determine which prime mover was the more efficient. He discovered Joule's first law in 1841, that the heat which is evolved by the proper action of any voltaic current is proportional to the square of the intensity of that current, multiplied by the resistance to conduction which it experiences. He went on to realise that burning a pound of coal in a steam engine was more economical than a costly pound of zinc consumed in an electric battery. 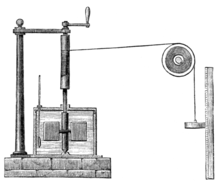 Joule captured the output of the alternative methods in terms of a common standard, the ability to raise one pound, a height of one foot, the foot-pound. However, Joule's interest diverted from the narrow financial question to that of how much work could be extracted from a given source, leading him to speculate about the convertibility of energy. In 1843 he published results of experiments showing that the heating effect he had quantified in 1841 was due to generation of heat in the conductor and not its transfer from another part of the equipment. This was a direct challenge to the caloric theory which held that heat could neither be created or destroyed. Caloric theory had dominated thinking in the science of heat since introduced by Antoine Lavoisier in 1783. Lavoisier's prestige and the practical success of Sadi Carnot's caloric theory of the heat engine since 1824 ensured that the young Joule, working outside either academia or the engineering profession, had a difficult road ahead. Supporters of the caloric theory readily pointed to the symmetry of the Peltier-Seebeck effect to claim that heat and current were convertible in an, at least approximately, reversible process. Further experiments and measurements by Joule led him to estimate the mechanical equivalent of heat as 838 ft·lbf of work to raise the temperature of a pound of water by one degree Fahrenheit. He announced his results at a meeting of the chemical section of the British Association for the Advancement of Science in Cork in August 1843 and was met by silence. Joule was undaunted and started to seek a purely mechanical demonstration of the conversion of work into heat. By forcing water through a perforated cylinder, he was able to measure the slight viscous heating of the fluid. He obtained a mechanical equivalent of 770 ft·lbf/Btu (4.14 J/cal). The fact that the values obtained both by electrical and purely mechanical means were in agreement to at least one order of magnitude was, to Joule, compelling evidence of the reality of the convertibility of work into heat. In 1845, Joule read his paper On the mechanical equivalent of heat to the British Association meeting in Cambridge. In this work, he reported his best-known experiment, involving the use of a falling weight, in which gravity does the mechanical work, to spin a paddle-wheel in an insulated barrel of water which increased the temperature. He now estimated a mechanical equivalent of 819 ft·lbf/Btu (4.41 J/cal). ... the mechanical power exerted in turning a magneto-electric machine is converted into the heat evolved by the passage of the currents of induction through its coils; and, on the other hand, that the motive power of the electro-magnetic engine is obtained at the expense of the heat due to the chemical reactions of the battery by which it is worked. Much of the initial resistance to Joule's work stemmed from its dependence upon extremely precise measurements. He claimed to be able to measure temperatures to within 1/200 of a degree Fahrenheit (3 mK). Such precision was certainly uncommon in contemporary experimental physics but his doubters may have neglected his experience in the art of brewing and his access to its practical technologies. He was also ably supported by scientific instrument-maker John Benjamin Dancer. Joule's experiments complemented the theoretical work of Rudolf Clausius, who is considered by some to be the coinventor of the energy concept. Joule could not resist finding antecedents of his views in Francis Bacon, Sir Isaac Newton, John Locke, Benjamin Thompson (Count Rumford) and Sir Humphry Davy. Though such views are justified, Joule went on to estimate a value for the mechanical equivalent of heat of 1034 foot-pound from Rumford's publications. Some modern writers have criticised this approach on the grounds that Rumford's experiments in no way represented systematic quantitative measurements. In one of his personal notes, Joule contends that Mayer's measurement was no more accurate than Rumford's, perhaps in the hope that Mayer had not anticipated his own work. Joule has been attributed with explaining the Green Flash phenomenon in a letter to the Manchester Literary and Philosophical Society in 1869: actually, he just noted (with a sketch) the last glimpse as bluish green. Joule died at home in Sale and is buried in Brooklands cemetery there. The gravestone is inscribed with the number "772.55", his climacteric 1878 measurement of the mechanical equivalent of heat, in which he found that this amount of foot-pounds of work must be expended at sea level to raise the temperature of one pound of water from 60 to 61 F. There is also a quotation from the Gospel of John, "I must work the works of him that sent me, while it is day: the night cometh, when no man can work" (9:4). The Wetherspoon's public house in Sale, the town of his death, is named after him "The J P Joule". The family brewery still lives on but now located in Market Drayton (see joulesbrewery.co.uk for more information on origins). A bust of him, by John Cassidy, can be found in Worthington Park, Sale. Further details of this work can be found at http://www.johncassidy.org.uk/joule.html. LL.D., University of Edinburgh, (1871). Albert Medal of the Royal Society of Arts, (1880). There is a memorial to Joule in the north choir aisle of Westminster Abbey, though he is not buried there, contrary to what some biographies state. A statue by Alfred Gilbert, stands in Manchester Town Hall, opposite that of Dalton. ↑ OED: (a.k.a. Jimmy Jewell) "Although some people of this name call themselves (dʒaʊl), and others (dʒəʊl) [the OED format for /dʒoʊl/], it is almost certain that J. P. Joule (and at least some of his relatives) used (dʒuːl). The Joule brewery used the confusion in its pronunciation in advertising: Childs, Stephen. "Chemical Miscellany". Chemistry in Action!. University of Limerick (50). สืบค้นเมื่อ 24 March 2010. ↑ Joule, J P (1841). "On the Heat evolved by Metallic Conductors of Electricity, and in the Cells of a Battery during Electrolysis". Philosophical Magazine. 19: 260. doi:10.1080/14786444108650416. สืบค้นเมื่อ 3 March 2014. ↑ Joule's unit corresponds to 5.3803×10−3 J/cal. Thus Joule's estimate was 4.51 J/cal, compared to the value accepted by the beginning of the 20th century of 4.1860 J/cal (M.W. Zemansky (1968) Heat and Thermodynamics, 5th ed., p. 86). ↑ Joule, J. P. (1843). "On the Calorific Effects of Magneto-Electricity, and on the Mechanical Value of Heat". Philosophical Magazine. 3. 23: 263, 347 & 435. สืบค้นเมื่อ 4 March 2014. ↑ Joule, James Prescott (1845). "On the Changes of Temperature Produced by the Rarefaction and Condensation of Air". Philosophical Magazine Series 3. Harper & brothers. 26. ↑ Joule, J.P (1 January 1850) "On the mechanical equivalent of heat," Philosophical Transactions of the Royal Society of London, vol.140, Part 1, pages 61–82. ↑ See Thomson, William (1848). "On an Absolute Thermometric Scale founded on Carnot's Theory of the Motive Power of Heat, and calculated from Regnault's Observations". Philosophical Journal. - See also the account in Thomson, William (1882). Mathematical and Physical Papers. Cambridge, England: Cambridge University Press. pp. 100–106. Reynolds, Osbourne (1892). Memoir of James Prescott Joule. Manchester, England: Manchester Literary and Philosophical Society. สืบค้นเมื่อ 15 March 2008. หน้านี้แก้ไขล่าสุดเมื่อวันที่ 27 กรกฎาคม 2557 เวลา 19:50 น.